Yves here. But Trump wants the headlines above all! In the case of the EU, in 2013 China qualified for GSP with about 60% of its exports to the EU benefitting from lower tariffs. However, in December 2012 the EU announced the removal of GSP benefits for Chinese products in most sectors starting from 1 January 2014, as they were deemed competitive on the European market. Moreover, China was removed entirely from the list of GSP beneficiaries in the following year as it no longer satisfied the condition of being classified by the World Bank as a lower-middle-income country for three consecutive years (Art. 4.1(a) of the EU regulation 978/2012).1As a result, Chinese exports to the EU were then subject to higher MFN duties. 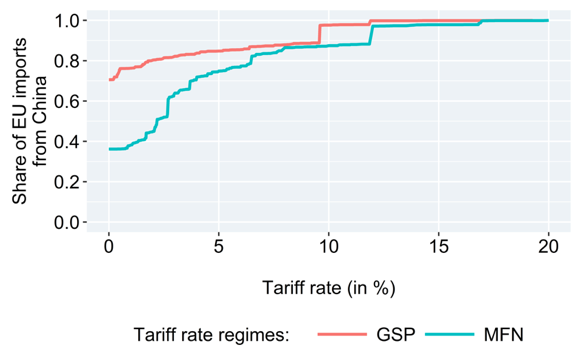 Lacking actual tariff revenue data, we use tariff rates reported by the WTO combined with import values from UN Comtrade to estimate how much the EU collected in import duties from Chinese products. 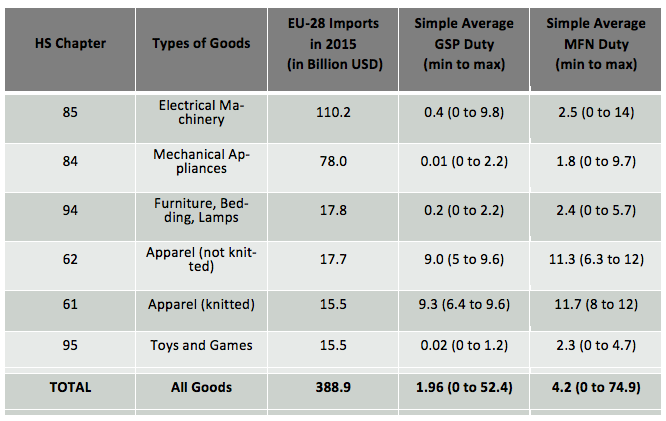 The dataset used for this analysis covers about 4,600 products (6-digit HS codes) for which we know the import value as well as the MFN and GSP ad valorem tariff.2Given that EU imports from China are stable in the years 2011 to 2016 at around $400 billion, we concentrate on import data from 2013 – the last year before Chinese imports were affected by the GSP withdrawal. Taking into account these qualifications, how important was the removal of China from the GSP for the EU budget? In 2016, total EU revenue was €132.2 billion, of which customs duties accounted for 15.2%, or €20.1 billion. While tariff revenue is relatively small for rich countries today, the EU is more dependent on such revenue. For a comparison, customs and other import duties as percent of tax revenue are about 1.9% in the US. Typically, the poorer a country, the higher this share. The EU’s share of 15.2% aligns it with developing countries like Cambodia or Burkina Faso.3Notably, EU import duties are collected by member states, which keep 20% to cover administrative costs and pass 80% on to the EU.4Figure 2 shows a sizeable increase in total EU customs revenue when China was removed from the GSP. 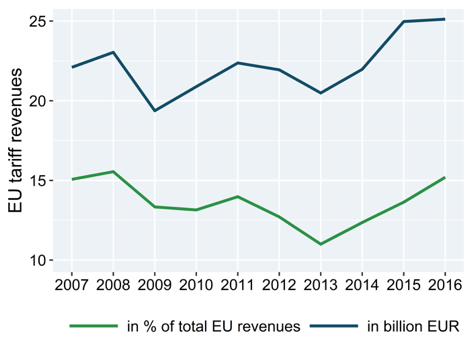 Looking forward, the contribution of customs revenue to the EU’s budget may reduce the bloc’s incentive to liberalise trade, especially in light of revenue losses following Brexit. The March 2018 recommendation by the European Commission to impose an “interim” tax on the revenues of foreign internet giants is another warning of a growing commercial policy-budget nexus. With a “suggested” tax rate of 3%, the Commission expects this imposition to raise €5 billion euros from foreign companies.5Yet another reason to expect a less open EU trade policy in the years to come. On 20 November 2012, the EU’s GSP reform came into force. It reduced the number of GSP beneficiaries to about 80 countries, while expanding the number of affected tariff lines (regulation 978/2012). Shortly after, the Commission announced regulation 1213/2012in which it reduced the number of country-specific sectors eligible for GSP. China was the country mostly affected by these changes coming into force on 1 January 2014. Finally, China was fully removed from the list of GSP-eligible countries by regulation 1421/2013on 1 January 2015. The Official Journal of the European Union, published on June 6, 2014 states that “Member States are to retain, by way of collection costs, 20 % of the amounts collected by them”. It can be found here. This entry was posted in China, Europe, Free markets and their discontents, Globalization, Guest Post on April 17, 2018 by Yves Smith. The Chinese government has a fundamental existential crisis that they have 20 years to solve. So they are demographically at peak productivity now which can last for another 20 years. After that, they have far fewer people to move into the work force to support a growing elderly population. so they are in a race to get wealthy before they get old. If the government is not successful at this, then the social order will likely become social disorder and the government would fall, probably in an unpleasant way. China does not have a history of successful immigration to fill demographic gaps, unlike the US and Canada. Europe is currently trying to do that but it is causing large social tension, resulting in things like Brexit. Everything that the Chinese is negotiating is stared at through this lens. Meanwhile our politicians struggle to have a 2-year perspective. This is just gonna help them out more when automation comes into play. Maybe this is what their Made in China 2025 policy is all about. To put the emphasis on quality over quantity to not only compete but also to use a smaller work force to boot. Interesting. I would have thought the increase in tariff would have reduced imports and made in-sourcing more attractive. Perhaps it did and maybe the growth in imports from China was less than it would have been otherwise? I guess one could compare to growth in imports in other countries, looking at their imports from China over the same period. But let’s assume that the growth was the same (i.e. stable) either way. I wonder if this gets back to the transcript from Micheal Hudson that was posted last week: https://www.nakedcapitalism.com/2018/04/hudson-report-trump-know-anything-trade.html . Prof Hudson identified that entities in China need to import currency in order to repatriate profits back to the home country. In that particular thread, the conversation was about US corporations in China repatriating profits back to the US. But presumably the same logic applies to EU corporations operating in China as well. Maybe we get Chinese corporations to have more of a presence in the US and get them to repatriate their profits back to China, thus making the yuan stronger? It sounds insane, but what else would work change the equilibrium? Getting the US corporations in China to pull up stakes and leave? That seems like a non-starter. I have to admit to being dispirited after reading what Prof. Hudson had to share. About the only upside to tariffs on Chinese goods is that it provides more tax income for the Fed Gov, per this article. Which if we were worried about funding of the US Fed Gov would be an issue.